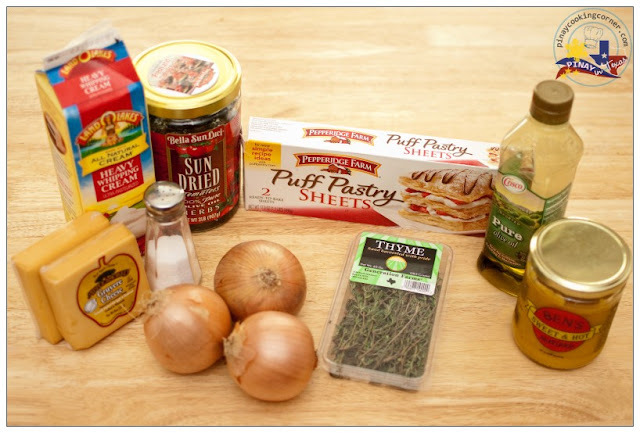 This is Chef Martin Picard's recipe and was suggested by Samanta of Samanthamenzies. Though we were given 4 recipes to choose from, I didn't have a hard time choosing. 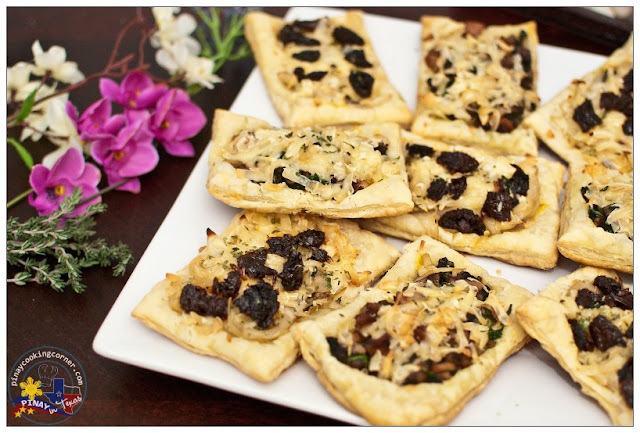 Aside from the fact that I soooo love sun-dried tomatoes, this savory tart is so easy to make. I actually planned of making puff pastry from scratch, but I got sick and didn't get the chance to, so I ended up using a ready made puff pastry. 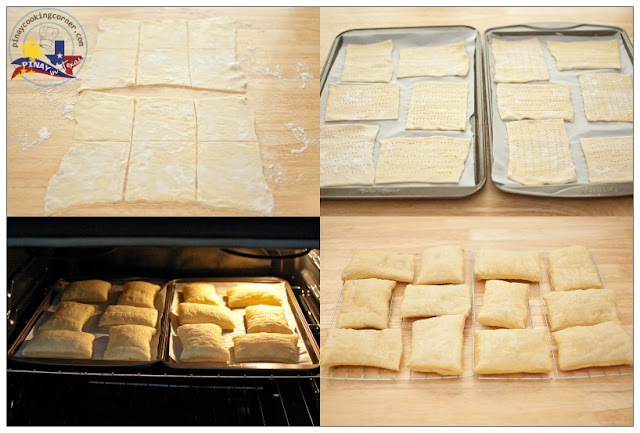 For easy serving, I pre-cut each puff pastry sheet into 6 pieces. Chef Picard's recipe calls for two sheets of 9x9 puff pastry. I wasn't sure if my daughters will like the Sun-Dried Tomato and Onion Tart, so I decided to cut the ingredients in half and just use one sheet. For the other sheet, I used a different topping. I sauteed 1 cup chopped ham, ½ cup onions, 1 cup chopped mushrooms, 1 cup chopped spinach and season it with salt and pepper. My daughters loved the ham-mushroom-spinach and Gruyère topping! But I must say, the hubs and I enjoyed the Sun-Dried Tomato and Onion Tart. 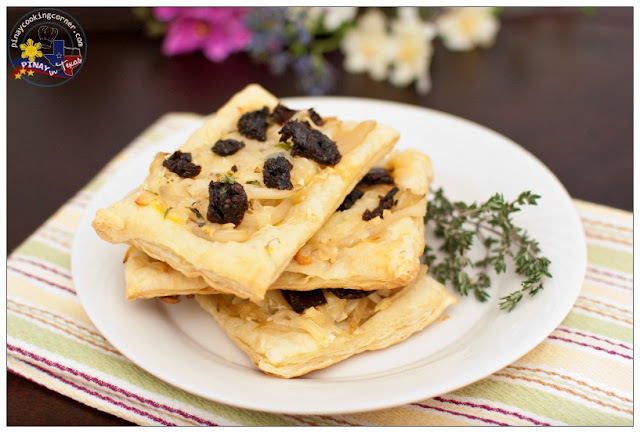 The layers of caramelized onions, sun-dried tomatoes and Gruyère cheese on top of that flaky crust was perfect for our taste buds! My sincerest thanks to Swathi of Zesty South Indian Kitchen for another wonderful challenge...and of course, Samantha of Samanthamenzies for choosing this recipe! 1. Preheat oven to 400 degrees. Dust a flat surface with flour and unfold the pastry sheets on it. Cut into 6 pcs. each. Line two baking trays with parchment paper and place sheets of puff pastry on them. Prick surface with fork, leaving a ½-inch border untouched. Bake until pastry bottom is lightly browned, about 10 minutes. Transfer to a rack to cool. 2. Meanwhile, prepare onions. Set a large sauté pan over medium heat. Swirl in oil and add onions, thyme and a pinch of salt. Cook, stirring occasionally, until onions turn golden and sweet, about 15 minutes. Season with salt. In a small bowl, mix mustard with cream. Once pastry is slightly cool, return it to baking tray and spread mustard-cream sauce over top, leaving ½-inch border untouched. Scatter half of cheese over sauce and top with onions. Add remaining cheese and tomatoes over top. 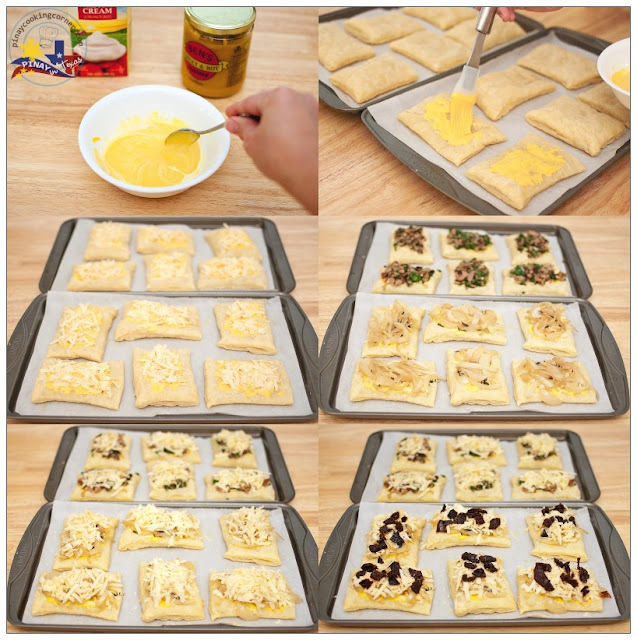 Return trays to oven and bake until cheese melts and browns in spots, about 15 minutes. Loved the idea of baking individually..Looks yumm and perfect dear..
Looks super yummy! Sounds great right now. Delicious tart Tina, love that idea of individual serving. It is really easy! And I am sure great snack. Its 7.40 am here and ur tarts just ignited a craving ......so beautiful! The tarts really look delicious. I am going to try this for sure!! nice idea to make the pieces as individual servings!!! looks so delicious!!! I seem to be loosing my comments. Anyway the idea of individual servings is great. Great tart. 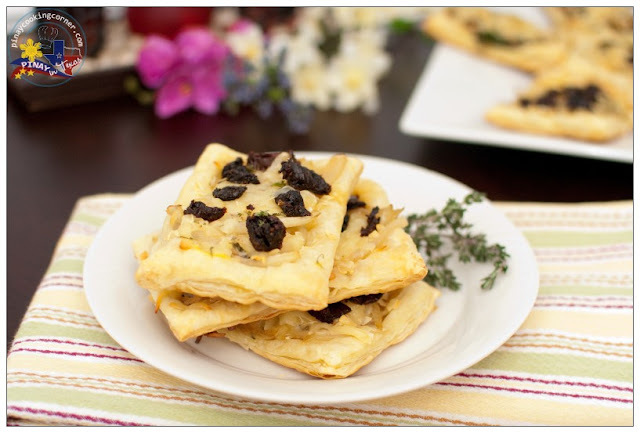 I love the crunchyness of these tart ( which I like ) :) sound delicious with onion and sun dried tomato ! !